In a ziploc bag, combine ingredients and shake well before adding meat. Add meat and let sit in the frige for 12-20 hours or overnight. Remove and pat off excess marinade. Place strips on dehydrator racks. Dehydrate until jerky is leathery but won’t snap went bent. Enjoy! Looking to buy turkey jerky? Check out Jerky.com for a wide selection of Gourmet Jerky. Am I supposed to cook the meat before marinating and dehydrating? Can jerky be made with pork? Marinate and prepare the meat prior to dehydrating it. Please refer to our dehydration page to learn more. Yes, pork can be made into jerky, however the process is a little more difficult because not as much moisture is removed as there is in any other meat product. Check out some bacon jerky at jerky.com and see for yourself…it’s delicious by the way. Do we cook the turkey prior to marinating it? Or do we use raw turkey meat? You use raw turkey. The meat will slow cook after done marinating. What in the heck is “mesquite flavored liquid”? I used Montreal steak seasoning (a dry spice) instead of liquid mesquite. 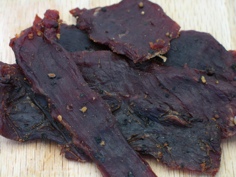 I used this recipe to make the beef jerky and will soon try it out for turkey jerky.